This week has been super crazy, but I’m proud of myself for still getting my weekly meal prep in order. Even though I’m only prepping four days worth of one dish, it’s still been a huge help and greatly reduced my tendency to just grab something to go in the midst of all this chaos. Thanks to the meal prep, I already have something “to go” that I made myself! Woot! 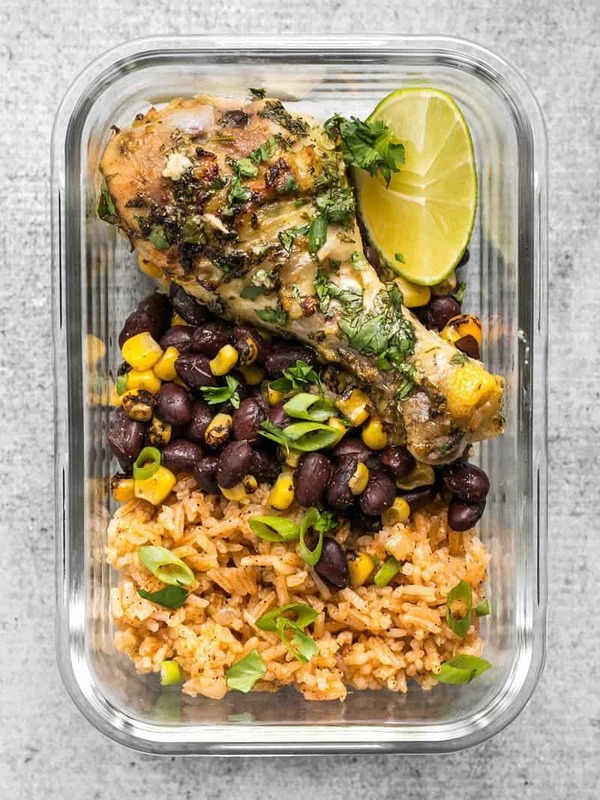 This week I’m hitting those summer/southwest flavors with this super easy Cilantro Lime Chicken Meal. 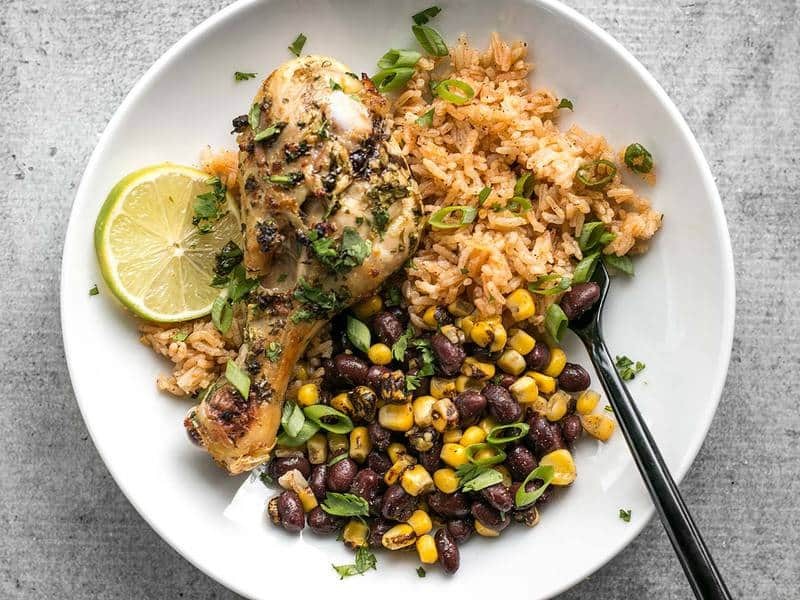 This week I’ve paired my super inexpensive Cilantro Lime Chicken Drumsticks with a classic Taco Rice and a simple mix of corn and black beans. If you’re looking to reduce your refined carbs, you can switch out the Taco Rice for Chili Roasted Sweet Potatoes, which can roast in the oven at the same time that the chicken bakes. 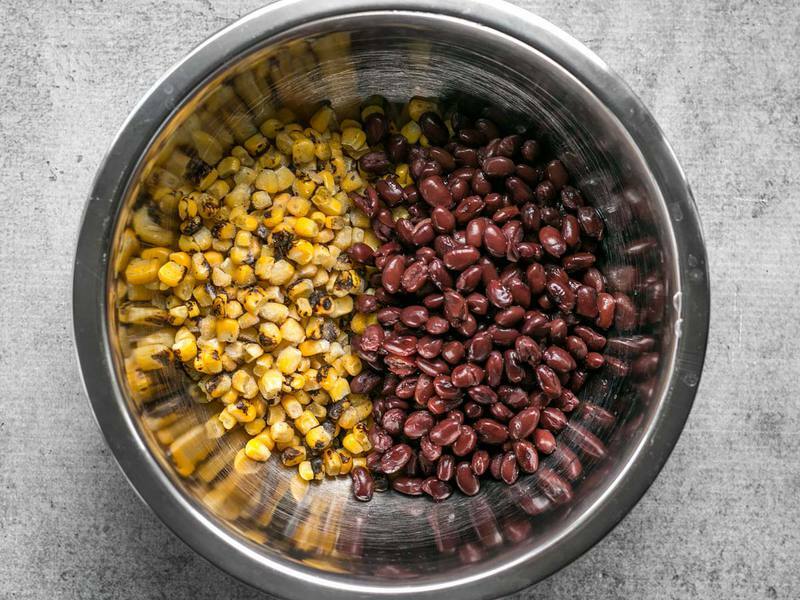 The mix of corn and black beans included in this meal is really amazing thanks to the frozen fire roasted corn kernels from Trader Joes that I had leftover in my freezer. I can’t even express how much flavor that “fire roasted” bit adds. It’s seriously amazing. I rinsed and drained a can of black beans, which is about 1.5 cups and combined it with about an equal amount of the frozen fire roasted corn kernels. I seasoned it with a pinch of salt and a light sprinkle of cumin and left it at that. I knew I’d be adding green onions from the taco rice over top and there would be a wedge of lime from the Cilantro Lime Chicken Drumsticks to squeeze over the whole box, so I didn’t feel like the corn and beans needed much else. This made about 3 cups of the mixture, so I put about 3/4 cup in each meal box. The Cilantro Lime Chicken recipe makes 4-6 drumsticks, depending on how many you buy in a pack. My pack had 5 this time, so I’d have one drumstick leftover. I simply gave that to myself as an extra with one of the boxes, or you could eat it with another meal. I don’t find that freezing cooked bone-in meat reheats that well. It takes far too long to get the bone portion to heat through. The rice, on the other hand, freezes well. 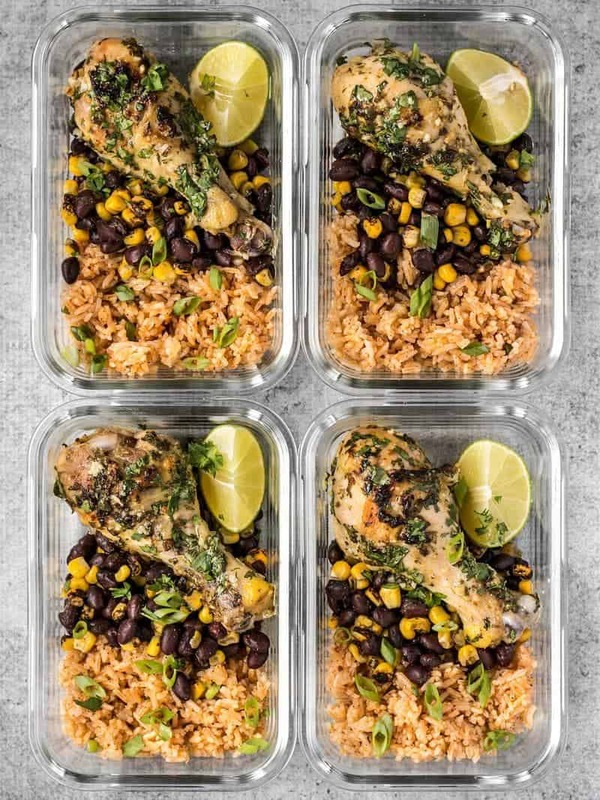 The Taco Rice recipe makes about 6 cups, so you can either give each meal prep box 1.5 cups instead of one cup to use it all up within four days, or portion out the extra two cups and freeze it as soon as possible. It’s very important with rice to cool it down quickly after cooking to reduce the possibility of food poisoning, so make sure to portion it, cool it completely, then transfer it to freezer bags for freezing. Q: What if I can’t stand to eat the same thing for multiple days in a row? As I’ve also mentioned, I like to prep only four days in a row to maintain quality and help reduce my “burnout”. Right now I’m only prepping one out of my three meals per day, so I still get a lot of variety through my other meals. I also always have at least a portion or two of other meals stashed in the freezer that I can grab to mix things up, if necessary. Q: Instead of eating one meal throughout the week, how do I use one ingredient across multiple recipes? Q: Doesn’t the food get limp/soggy/gross? A: Yes and no. Leftovers are never going to be the same as they were the day you cooked them, and they’ll continue to change every day that they’re in the fridge. Whether or not this will be tolerable to you is very personal, but I will try my best to include tips for each meal to keep the food tasting its best over the four days! But, as with question number one, if you are super sensitive to flavor and texture changes, meal prepping might not be the solution for you. That’s it for this week!! Do you list the macro info? Didn’t see it listed unless I missed it. No, I’m sorry, I don’t have the nutritional information. Just made this and my husband and I were blown away, I’m vegan so made the chicken for him while at the same time marinated and cooked some tofu in the lime cilantro. The marinade made for some awesome tofu and was a rare treat to feel like we were having the same meal. Can’t wait to try doing the same chicken/tofu thing with some of your other recipes.